The tenants at 2120 South Central Avenue–a couple renting the three-story house–were downstairs when they heard what looked and sounded like two or three successive lightning bolts as if on top of the house. When they went upstairs, flames were leaping out of closet of the master bedroom, which occupies most of the third floor. Flagler Beach and Flagler County fire departments were just then busy fighting a small brush fire near Wadsworth park, on the mainland. When the tenants called 911, Flagler County’s Engine 92 and Rescue 11 units were on their way to the brush fire, Flagler County Fire Chief Don Petito said. 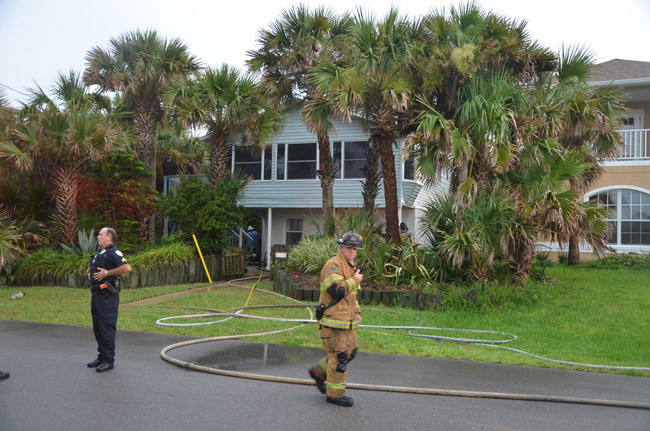 They bypassed the fire and went straight to the house fire in Flagler Beach, near South 21st Street, not far from the Beachhouse Beanery. Capt. Jamie Burnsed took command and a total of 14 county firefighters went to work, getting the fire out, Petito–who was briefly at the scene later–said. The fire was contained to the upstairs bedroom, but it caused significant smoke, water and structural damage as firefighters had to excavate parts of the roof to ensure that the fire, which had also affected the attic, was out. There were no injurries. The fire occurred around 3:30 p.m.
“Once the fire was under control and the danger was over we turned it back over to them,” Petito said, referring to the Flagler Beach Fire Department, which was under the command of Bobby Pace. The county had three engines, two rescue rescue units and the battalion command at the scene. Flagler Beach had an engine and a brush atttack, then its tower truck, which proved unnecessary. 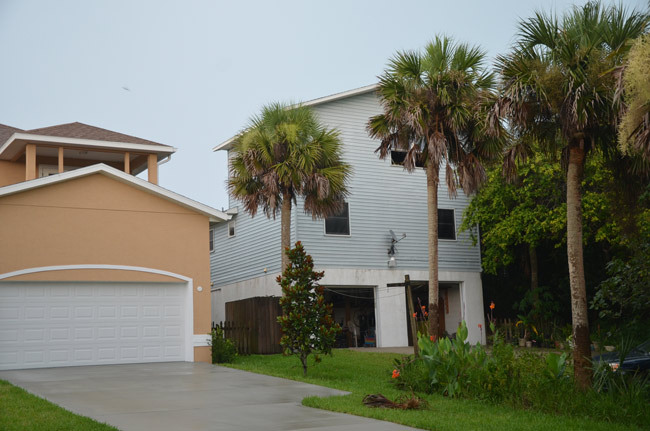 The 2,000 square-foot house on South Central belongs to Patrick and Mary Anita Giordano, and has a currently assessed value of $212,000, according to Flagler County Property Appraiser records. I am just glad nobody was hurt. Also glad county was nearby to run the scene!